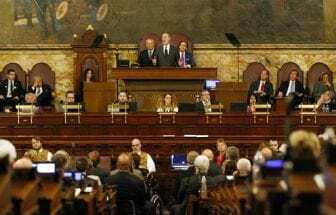 HARRISBURG, PA (WSKG) – A bill that could have reduced the size of the state House is dead. This is the closest such a measure has come to passing in recent memory–but ultimately, not enough House members wanted to potentially axe their own seats. It passed last session. But this time around, lawmakers added a provision that would have shrunk the Senate too–essentially a poison pill. The most recent vote would have stripped that provision out and allowed the amendment to go to voters for a referendum. Ultimately, they didn’t do it. Though the bill hasn’t been formally voted down, it’s considered functionally dead now. If supporters want to try again, they’ll have to restart the effort from scratch next year. Berks County Republican Representative Jerry Knowles, who sponsored the bill, has said he’s not sure if he’ll attempt it again.